Cream or not to cream? A question we all want to know! We live in a world where a person can order a coffee in just about anyway you can think of. From as simple as black coffee, to adding flavored sweeteners, spices, pumpkins, condensed milk, and even…dare we say it, butter! For a lot of people, it’s all about the luxurious and satisfying texture of CREAM! There is something mesmerizing when pouring cream into a coffee, especially over a cold brew. The swirls of heavy, fatty liquid mixing with the rich color of the brew look like a piece of art coming alive right in your cup. At Amavida Coffee, roasting and brewing IS a form of art and it is a goal of ours to craft specialty coffees that appeal to all types of coffee-drinkers. The avid caffeine sipper tends to be a purist, but that is not to say that the occasional cream in our coffees is unheard of. 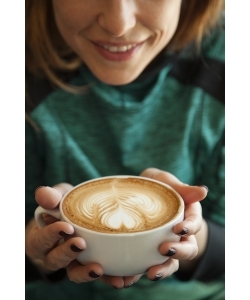 For some, it provides a mouthfeel that is much different than a regular cup of coffee, and for others, it’s a matter of preference based on taste or the type of brewing system. All journeys on the road to caffeination via the coffee bean are different and should be celebrated. We are here to provide some information from our team members and milk in coffee drinkers about why this seductive liquid tempts our coffee regularly. Just what is it exactly about a cream that has made humans add it to their coffee for hundreds of years? FAT! It’s so good, our bodies crave it, and it takes just about anything to a different level. Milk possess two key compounds (protein and fat) that help to cut the unwelcome flavors of bitterness, ash, and an over roasted flavor in coffee. Roasters such as ourselves work hard not only to roast a bean that is lacking these unsavory flavors but to also work with our farmers directly to produce a bean that is unlike any other. Brewed coffee contains a chemical compound called “tannins” which are a naturally occurring process and can be found in other drinks we frequently consume such as beer, wine and fruit juices. Proteins from the milk bind with the tannins in the coffee, cutting bitterness and softening its acidity; while Fats enhance the mouthfeel of coffee, making it seem more velvety while also activating fat receptors on your tongue. Some coffees have higher tannins and fewer acids which cut through the fat and proteins of milk easier, allowing the flavor of the coffee to shine through a little more. Darker coffees often have these characteristics because the process of roasting takes the sugar past its peak and begins to burn. This makes for a more bitter, heavy and lingering flavor coffee that pairs well with cream. In a good roast if cream is added it can disrupt the beautiful balance of sugars and organic acids that a properly roasted and brewed coffee has to offer. We know what you are thinking, so, why doesn’t espresso and it’s steamed milk partner in crime catch such a bad rap? Steamed milk is actually sweet! When milk is brought to the proper temperatures of 130-140 degrees it enhances the sugars that are found in milk. Espresso is about ten times as concentrated as regular drip coffee and in a lot of places can be enjoyed strictly on its own. The sweetness of the milk paired with the strong concentration of the espresso creates a combination that is quite perfect. Our Director of Coffee recommends with a well-roasted espresso to use one part milk beverage and one part espresso for the best enjoyment of the two. For the Love of All Things Coffee…WHY!! front door. Coffee is a routine for people. It’s something we do without hesitation and it’s likely that most of us drink our coffee the same way every day. In some cultures making a cup of coffee is a long spiritual process, and in other places, it’s a time for slowing down in a social setting. In Italy, certain types of coffee are enjoyed during different times of the day as opposed to the Vietnamese tradition of using condensed milk for a velvety sweetness. 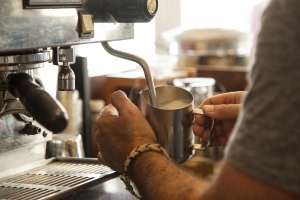 Adding cream to a specialty coffee can mask the flavor. It may leave you feeling caffeinated, but missing out on flavor notes that coffee has to offer. It’s like adding steak sauce to a high-quality steak or adding bitters to a perfectly aged bourbon. 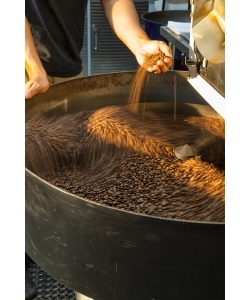 A good roaster should understand how to bring out sweetness (not bitterness) in every coffee. 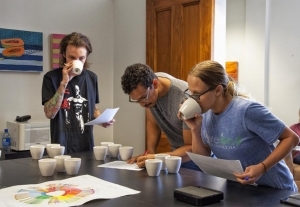 A good barista should understand how to brew that coffee to bring out those flavor notes. It’s all about the sweet, that is the goal. There are no cardinal rules to coffee and it’s something that is meant to be enjoyed by all in whatever way you prefer it. Do we want our customers adding cream to coffee? Of course not! If we could we would spend all day talking to each person about the origin of the coffee they chose, the farmer who grew it, the notes in the coffee, and how elevation, soil, and roast bring out different flavors. At Amavida it’s about building a relationship and connection with our wholesalers, farmers, employees and most importantly our coffee consumers. We hope to educate our consumers, but also support your love of coffee and that journey with the coffee bean that you are on! Our Social Media Coordinator, Bianca, mentioned that once she started to understand the origins of the coffees then she began experimenting with other elements in the coffee. This helped her to narrow down just how she likes to take coffee and discovered that some coffees taste really wonderful with cream and others just don’t need it all. Amavida is here to provide the best product no matter how you take your coffee. Coffee is a feel-good beverage. If the swirly cream mixing with your coffee is what makes you feel good, then keep on doing your thing. It’s s about the experience and the feeling it provides you every day. It’s that jolt of energy needed in the morning, the excuse to hang out with a friend, the comfort of home, and the pick me up someone might need. We want get to know you and all of your coffee quirks. So, if you are in one our local shops and feeling adventurous, talk to your barista. Maybe even try a coffee without cream. It may change everything you thought you knew about coffee.